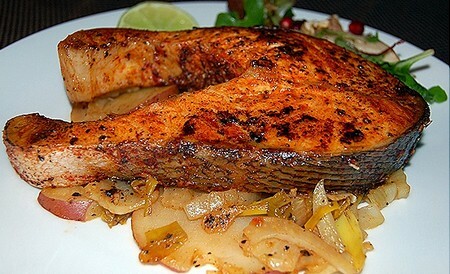 Salmon is not only a popular and delicious food item but it is a healthy choice as well. Salmon naturally contains good levels of Omega 3 fatty acids. This along with other nutrients, make salmon one of the better food choices. You can prepare salmon many ways. Baked salmon is the most popular form of preparation. Salmon is easy to make and season. It does not take long to cook either. Here is a recipe for cooking salmon. It is simple and not difficult to do. Read on for further instructions on how to cook salmon. Look over you salmon. Make sure there are no bones. Remove any you may find and throw them away. Line a baking tray with aluminum foil. This makes the clean up afterwards very easy. Put the fresh salmon on aluminum foil lined baking sheet. Apply some seasoning to the salmon. Put margarine or butter on the surface of the fish. Make sure that the entire fish is covered well. If you need to soften the margarine or butter to make it more pliable to spread, put it in the microwave for a few seconds. Continue spreading over the salmon. Season the fish with dried parsley and lemon pepper. Squeeze the lemon slices over the fish to add a zesty flavor. Put the salmon fillet in the oven and cover it with aluminum foil. Bake the fish for about 15 minutes. The time may be shorter or longer depending on how thick the salmon actually is. More time is needed for bigger and thicker salmon fillet. Less cooking time applies to the salmon fillets that are smaller or individually wrapped fillets. Zest the skin off of lemons while the fillets are in the oven. Check on the progress of the salmon after about minutes. To do a proper test you will need to insert a fork into the thickest section of the salmon. If it flakes it is done. If the salmon is still sort of tough and under cooked, continue to bake it. Every 2 minutes recheck the fish. You are looking for the salmon to gently flake. That’s the indication that it is cooked all the way. 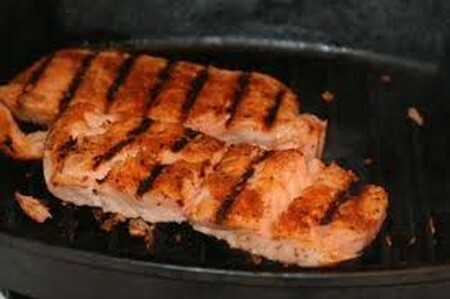 When the salmon is cooked take it from the over and add a final spritz of lemon juice and zest. Serve with tartar sauce while hot. Enjoy.